Last week I managed to drop something heavy right on the edge of the counter top, breaking off the finish in two places. I pondered how I might fix it, as I could easily see it upon entering the room. And I knew that would drive me crazy. I didn’t think to take a photo before I started out applying a bit of white paint. But the Formica underneath was a dark color. I looked in my small stash of paints, as I was determined not to have to go purchase anything for the fix. Luckily I had a few paint colors that I thought would work. 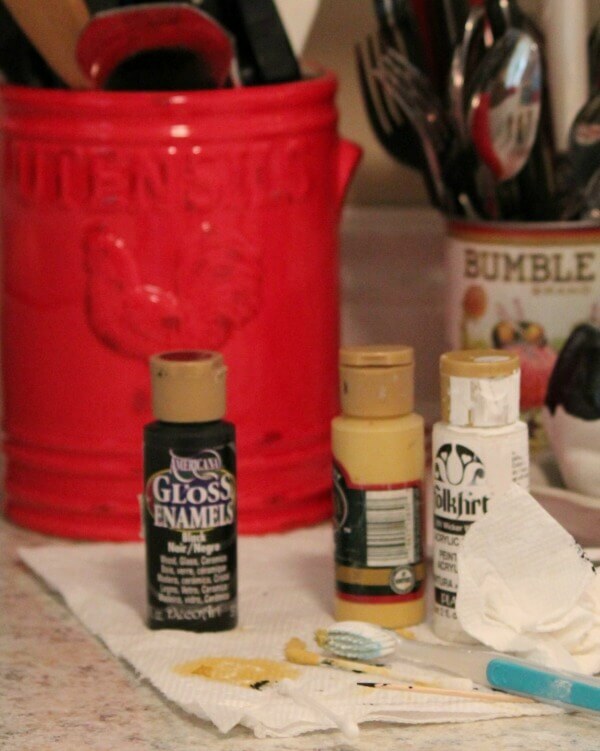 I had used similar paint colors in the GianiGranite kit I originally used to transform the counter tops. White, gold and black. I got out an old tooth brush, a Q-tip, and a few tooth picks to use in tiny areas. Then I tore off a paper towel and dampened it. You can see in this photo how dark the broken edge was after it was damaged by the heavy object. The first piece that was broken off was at least an inch long. The second was about half that width down a bit farther. Had it not fallen right on the edge, I don’t think there would have been any damage at all, for the GianiGranite kit I used has held up quite well. In the above photo, you can see where I’d dabbed a small bit of all of the paint colors onto the first damaged area. I just kept adding, dabbing, and letting dry. Then an hour or so later, I’d go back in and work a bit more. I’d dab a bit of paint on with the tooth brush or a tooth pick. Then I’d smudge the paint with the damp paper towel. I really had no idea if this would actually cover and repair it. This is what it looks like now, after multiple layers of the various shades of paint. If you get up really close you might be able to see the two places where I repaired it. But I no longer see it when I walk in my kitchen, and I am happy with how it turned out. Plus it cost me nothing to fix it. I still stand by my recommendation of GianiGranite. This was the first time in the 14 months after I originally applied it that anything happened to mar it at all. 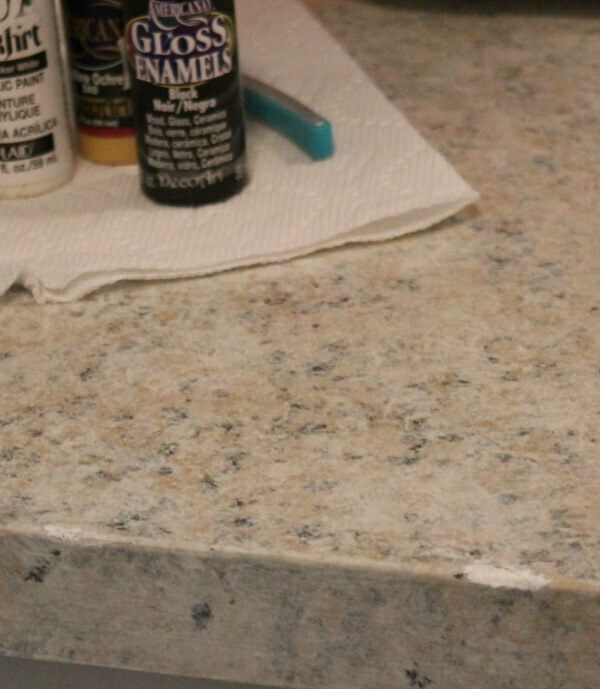 This is a very durable fix for old counter tops you don’t have the money to completely overhaul. Or for renters like me where that isn’t an option. You did a great job, it looks amazing. I used a similar treatment about 6 years ago and it's held up and I cook a LOT.I recommend this highly for anyone who needs a change for their existing counters. The counter tops look great and your fix is great. Glad you were able to do that with no $$ involved. well done indeed~!!! looks beautiful. Wow Brenda you have done a great job on the counter top both before and after your accident. 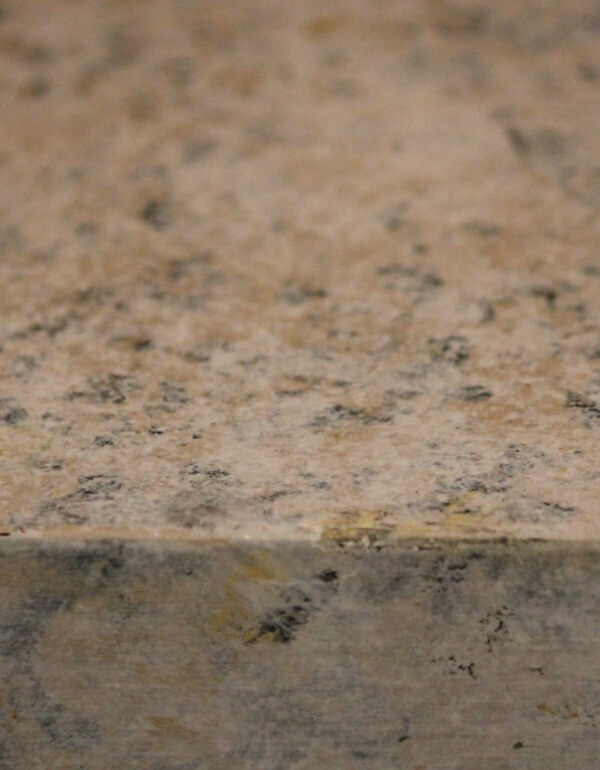 We have granite countertops in our present home and I just hate the color (much too dark) and I must admit I have often dropped things too but luckily it hasn't broken. I have never heard of the product GianiGranite but it sounds like a great product. I went into the website and looked at the befores and afters, it does a great job on old or formica counters. I like the color you chose too. You did an amazing job repairing that, Brenda! 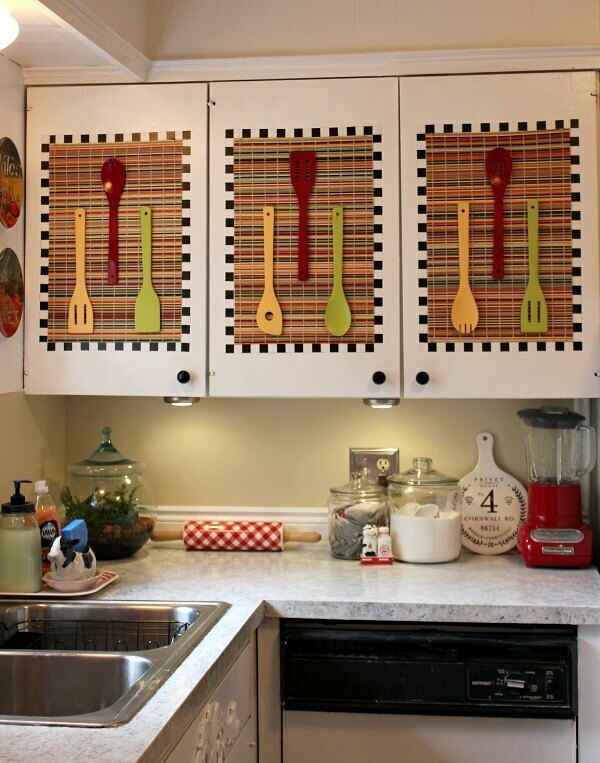 I'm really impressed with how well those counters have held up, what a great product! 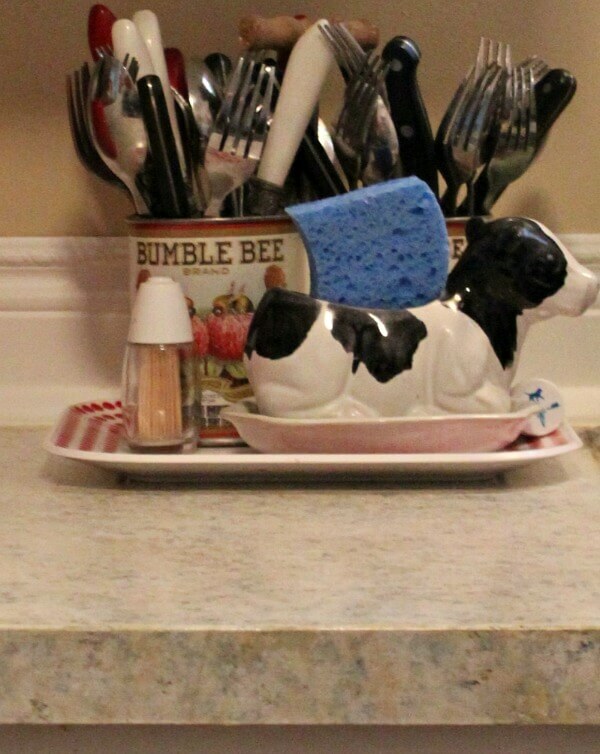 You are very creative and the countertop looks great! 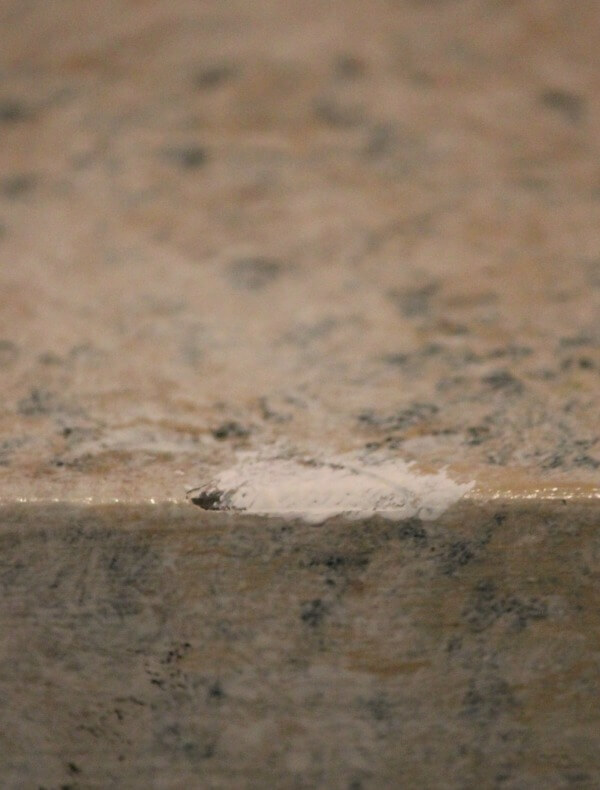 You did a great job both times — with the original transformation on the entire countertop, and then with your repair work. It sounds like you had confidence in yourself that you could fix it, and you did! Your kitchen still looks so inviting, with no chips in the counter to mar it. That's an awesome repair, Brenda. You really are an artist. Great job Brenda! I think it takes so much more talent to decorate and DIY like you do than it does to pay a contractor. I admire your creativity and talent. I read your blog because you are like most of us out there who can't afford to pay thousands of dollars to fix and decorate. Keep up the good work! you're wonderful dear bean. beautifully done! I must say Brenda, every time I see your kitchen, I'm still so impressed over how good your counters look. I bought a kit like that for the laundry room counter in my other house, but returned it because I was too afraid to go through with it. The repair job you did looks great! Unless you pointed it out, no one would even notice. Just a thought, since you used paint, even though it's enamel, does it need to be sealed to protect it from wearing away?